At ŠKODA, we’re driven by something different. We’ve been supporting drivers and cyclists with the same approach to life for over 120 years. With strong cycling connections in our roots, ŠKODA is committed to making the sport more widely enjoyed by men and women alike. Our passion for life on two wheels has driven us to inspire others to saddle up. Through our new #ThisIsOurTime campaign, we’re encouraging everyone to discover the fun and exhilaration of life on two wheels. Over 120 years ago ŠKODA started life as a cycle company and since then our love for two wheels hasn’t wavered. Cycling has remained important to us since that day and we’ve honoured that heritage ever since. When co-founder Vaclav Klement bought a bicycle from a German manufacturer which broke not long after, he teamed up with bike mechanic Vaclav Laurin and they began producing their own bicycles. The two had much in common, not just their first names and a love for cycling, they also had a strong inventive spirit and 1895 saw their first invention together, a bike called the ‘Slavia’. Very quickly there were five Slavia models on offer, including a ladies and a hybrid bike. Step by step, the bicycle range was expanded. There were tandem bikes ‘for two gentlemen’ and ‘for a gentleman and a lady’, children’s bikes for boys and girls, delivery tricycles and speciality bicycles with a drive shaft. 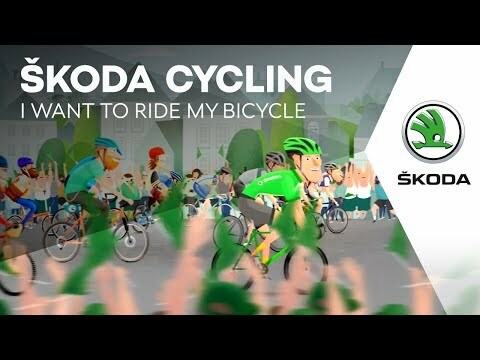 Over 100 years later ŠKODA continue to be involved in cycling at all levels from sponsoring the Tour de France to getting everyone active on two wheels.